The day after they arrived I went to see James, our local vet, he stated the obvious- she was severely underweight, and also gave her a thorough healthcheck. Being a victim of neglct can often mean lots of issues are present- not always major, but treated wrongly or not treated at all things can get worse. I was advised that a Gorgeous Guineas bath would be a good start for her and the others and to obviously include administering Otodex ear drops too in case of any ear problems, despite there being no evidence of any. 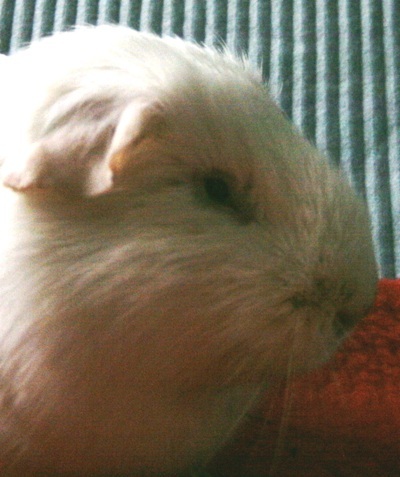 Ear “problems” is not something I come across very often at all on Planet Guinea, all my own guinea pigs are bathed (and that includes the routine of ear cleaning and administering Otodex ear drops. The rescue guinea pigs receive the same treatment which “nips everything in the bud” so to speak. James, being the walking encyclopaedia that he is, proceeded to tell me that if Nibbles were a dog there is a wider range of products, however they contain steroids whichare abused by many vets to treat the symptoms but not the disease, there is no place for them when treating guinea pigs be it ears or otherwise. Nibbles also had treatment for mites as her rump had a bald patch- quite possibly a post pregnancy hairloss as there were boars brought in with the group. Nibbles did well, she responded to the treatment for mites and her hair grew back lovely, she put on a pound in weight (she weighed just over a pound on arrival) and began to appreciate that there would always be another meal she didn’t have to eat everything all at once. When I felt a mass in her abdomen I checked the dates to see if we were about to welcome some mini pigs but the dates said that was impossible, so it was another visit to see James and see what he could make of it. Nibbles had an internal abdominal abscess that stretched across her abdomen. It was a case of do or die- so we did. James is an excellent surgeon and I had every faith in him. Nibbles came through the op well much to James’ delight too, but half an hour after coming round she had a cardiac arrest, fortunately James was on hand and brought her back, all was well. 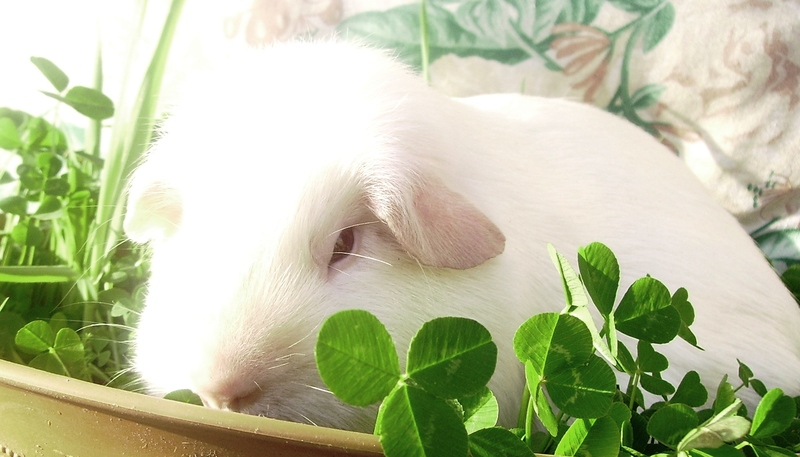 Earlier this month Little Miss Lucky left us to become a star on Planet Guinea. She is the white one that bounces around and desperately tries to get in front of the of the others, if not on them! Little Miss Lucky arrived in 2009 after having over 5 homes in 2 weeks. She was brought here because she ‘wouldn’t live with anyone’… It wasn’t long before Little Miss Lucky had chosen to live in a herd and was adjusting to being part of a group as nature intended. I am proud that she was chosen as a case study by a local Animal Aromatics student but even more ‘stunned’ at the benefits she experienced. Despite never fully overcoming her physical hormonal issues Miss Lucky’s behaviour changed dramatically, proving that, for her, the issue was not linked to what was happening physically (Ovarian Cysts), if it wasn’t for the hairloss there was no indication that anything was wrong. Tonight there is a new shiny star on Planet Guinea. Sunshine is the golden shiny star hovering in the background, occasionaly moving out to the front with the others for a while before returning to her background spot. Sunshine is the golden brown star with slight speckles of black that ‘just fits in’ with everything around her. Sunshine had been having minor dental work since September, her Incisors were often slanted but there was no sign of any Molar problems. On Saturday she had her usual ‘check up’ and I found some brown marks on her top molars, but not like those I have seen on Satins with Osteodystrophy (which were blackand pitted), this was a definitely brown but unusual (or at least not something I’ve seen before), brown marks. Apparently this is evidence of either something ‘happening’ in the gums or due to Antibiotic use, Sunshine was not on antibiotics. I was expecting her to have a tooth root abscess or similar given the ‘symptoms’. On Sunday Sunshine wasn’t herself, not eating as much as normal and refusing to take water from a syringe or bottle when offered- Sunshine was a big drinker. Luckily I had some Rimadyl left over from when Aura was ill and I gave Sunshine some in case she was in any pain. However, this morning Sunshine had chosen her own time to go which although unexpected was not a complete shock. Sunshine was part of a large RSPCA rescue of a lot of Satin guinea pigs that had been allowed to breed freely (not a breeder in the Cavy Fancy) and were living in very cramped condition, the group was split (it was sooo big,100’s of them) and went to different parts of the country. When Sunshine arrived she was fit and well though needed to put on some weight. Summer on the grass saw to that and she joined Cloud’s girls (as the cages were full) with a view to being rehomed. However as satin it would be to a home that had been made aware of the possible issues with osteodystrophy. That home never turned up and Sunshine became part of the group immediately, just getting on with her little life, no special friends or enemies but fitting in perfectly 🙂 . Last year Sunshine did her one and only Piggy PM, she went along to show the difference between a matt coat guinea and the sheen on a Satin. 2000: Emily’s friend Charlotte died and I couldn’t find a rescue to get her a friend so, after finding Phoebe in a local pet shop, I set about finding out about starting a rescue and then saw the local RSPCA branch advertising for cat and dog fosterers. I decided that I would phone them in the New Year to see if they wanted any guinea pig fosterers. There was no question of doing rescue unless there was some financial backing to pay for vet bills. 2001: In February we became fosterers for the local branch of the RSPCA, we were advised to start small and try and establish what sort of numbers would be manageable for us. At the time we also had our own guineas- Phoebe, Emily and Molly and I was studying the BAR Rodentology course, taking in a few rescues also seemed like a good way of gaining experience, however nothing ever goes to plan and I became more involved in rescue and rehoming (which was teaching me more than any course), But I did pass part one with flying colours and half of part two (getting 100% on the guinea pig part) before deciding that rescue and rehome was the path I needed to follow and commit to. 2002: Our first two single rescue boars were bonded, Dougal and Ted. Dougal and Ted were rehomed to live free range in a shed and both lived until they were 8 years old. I met Chrissie who was to play a significant part in RGPR, not only did she adopt the lovely Florence, she offered to build be a website (high tech in 2002, or at least I thought so!). Apparently ‘everyone has to have one…’. Eventually Chrissie persuaded me to take it over when Gorgeous Guineas became a full time business. 2003: This year saw the back of Vetsect Repel, my favoured shampoo for bathing as recommended by CCT and Peter Gurney. Chrissie stepped in to help once again when RGPR took in a group of 18 Fungal Guineas by fostering a pair and, with the permission of our vet, using some gentle shampoos she had made. I haven’t used anything else since. 2004: The Satin Study UK was undertaken by a group of UK Guinea Pig Enthusiasts with the aim of finding out if Osteodystrophy was present in Satin Guinea Pigs. UK breeders ‘donated’ x rays of their satins and in lots of cases we were given detailed ‘family trees’ which made for some interesting reading. Several Satins were also given to RGPR, we had a variety of purebreds and pets. Osteodystrophy has proved to be a subject with many grey areas, as would be expected, and there are varying degrees of the disease. 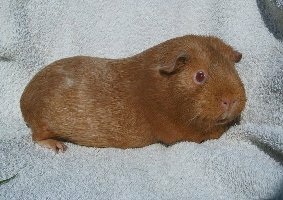 Satins have been rehomed from RGPR, it doesn’t seem fair to deprive a guinea pig of a home because this may develop. All new owners are advised on symptoms and what to do before making the decision to adopt a satin guinea pig. 2006: In 2006 the current Planet Guinea shop was opened to sell the surplus seeds that we grow here. Our ‘new vet’ Jenny was already showing lots of promise with guineas and was starting to see nearly as many as James! 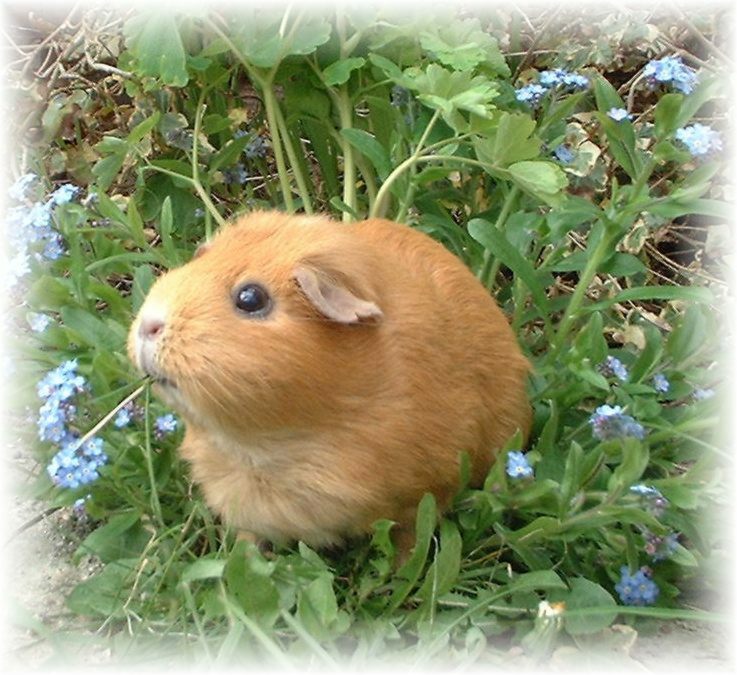 2007: Chrissie, from Gorgeous Guineas, adopted Chase who was born here in 2004, adopted in 2005 and returned 2 weeks later because of an allergy one of the Humans had suddenly developed. Until Chrissie asked if we could try her with Marbles and Florence she had been completely overlooked. This year saw our very first Piggy PM held at Active Vetcare with kind permission from the then Senior vet, Alison. 2008: A good year for rehoming, we rehomed 46 guineas to Animal Welfare Act Compliant homes, but took in 60, some of whom are still with us… I should add that the ones still here were all, except one, born here and are all boars. Because of the large intake in comparison to those rehomed I decided to base my 2009 intake on 2008’s rehoming. 2009: Money from the 2008 and 2009 Piggy Pms has paid for the final blocks of hutches and rest has gone towards the new store shed. Work started on this in 2009 and is still work in progress. Planet Guinea and Gorgeous Guineas got together for Comic Relief and made up a Party Pack with Red Stripe Bags of Fun and Happy Souls shampoo, with all profits donated to Comic Relief. Here’s to another 10 happy years.